"Africa is solidly behind Blatter.," said Kwesi Nyantakyi, the president of the Ghana FA. Nyantakyi, who is also a Confederation of African Football executive committee member added: "You will find he is very popular on the continent." On 29 May, Blatter will seek a fifth term as president that will take him past his 80th birthday. Dutch football association president Michael van Praag announced on Tuesday his intention to run following similar moves by former Fifa deputy secretary general Jerome Champagne and Prince Ali Bin Al-Hussein of Jordan. Former France international David Ginola has also announced his intention to stand but his is widely regarded as being no more than a publicity stunt. 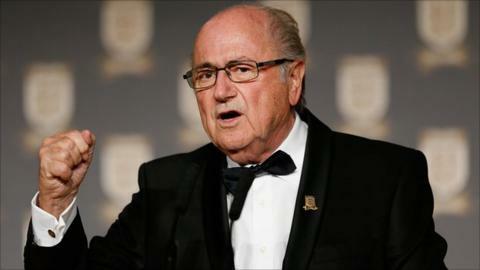 But Blatter's prospective opponents are likely to get little support from the 53 African voters. "The continent is united behind him," added former South African FA president Molefi Oliphant, who still serves on the Caf executive. "We made a formal endorsement of his candidacy last year at our meeting in Rio de Janeiro already." Previous endorsements from Caf, however, have not necessarily translated into votes. African football's controlling body promised Lennart Johansson a block of votes in 1998 but member associations took no heed and helped Blatter to victory. In 2002 Caf president Issa Hayatou failed to muster significant support from his own continent and lost heavily to Blatter. Affection for Blatter stems from the generous financial assistance he has given Africa during his 17-year tenure. "He has done a lot for the continent. It is he who has set up the financial assistance programmes and who through the Goal project has built infra structure in all of the countries," added Nyantakyi. "The Europeans don't understand that. They say it is not his own money but Fifa's but that's not the point. "He is the one who set up all the assistance programmes that have helped boost African football." Goal is Blatter's pet project, inaugurated not long after he came to power in 1998 that has built training centres, accommodation, pitches and offices for cash-strapped associations. Under Fifa's Financial Assistance Programme, introduced in 2001, each of the ruling body's 209 member associations receive generous grants with more than $1 billion paid out during Blatter's tenure.